For the last two Saturdays the girls at Fresh Gardens have sold collard greens. I’d never cooked and eaten them before and seeing them I automatically thought of the cuisine of the American South without actually knowing what that meant in relation to these big green leaves. So I did some homework and found that collard greens are part of the brassica family particularly the same branch as kale. They’ve been grown and eaten for over well 2000 years and, as well as being a staple vegetable of Southern US cuisine, collard greens as grown in Brazil, Portugal, many parts of Africa, northern Spain and northern India and the Balkans. In one recipe I found collard greens weren’t cooked but very thinly sliced and dressed with a fresh lime and ginger mix that tenderised it. I used that idea in this salad. Change the quantities as you like. Toss the pumpkin cubes in olive oil, thyme leaves, cumin seeds and garlic. Spread on an oven tray and cook in a moderate preheated oven for about 30 minutes or until soft and a little brown. About 5 minutes before its ready, drizzle with a little pomegranate molasses and put back in the oven. This isn’t essential but it enhances the sweetness of the pumpkin. Place the broccoli florets on another oven tray, drizzle with olive oil, season and, if you want a little heat, sprinkle with a few chilli flakes. Cook in the oven for about 5-10 minutes until the broccoli is starting to brown and is still a bit crunchy. Combine the ginger and lime juice and leave to sit for 5 minutes. Strip the collard leaves from their stalks. Stack the leaves on top of each other and tightly roll up so it looks like a big cigar. Slice this very finely. Place in a bowl and add 1-2 tbsps of the lime and ginger mix. Using your hands mix and massage this into the sliced collard greens. By themselves the leaves are tough but this mix seems to soften them. 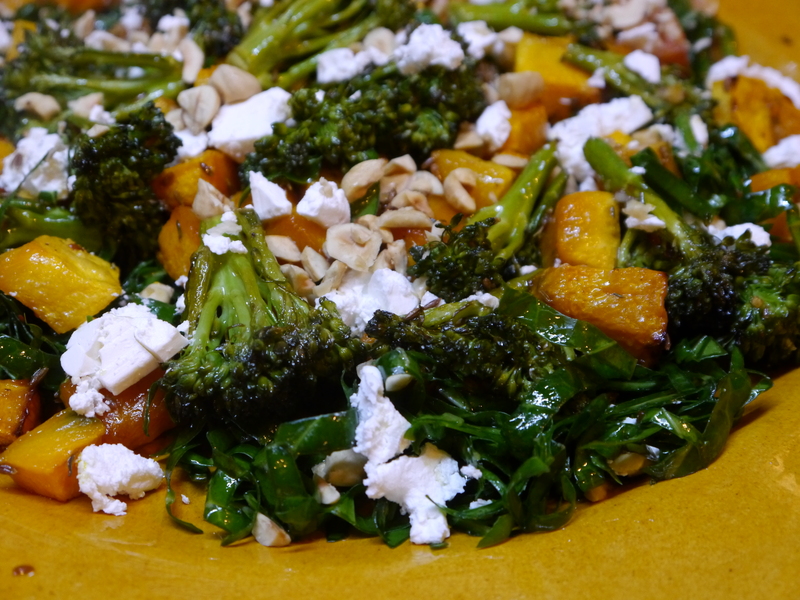 Now assemble the salad starting with the collard greens and then top with the pumpkin, broccoli, some crumbled feta and chopped nuts. Mix olive oil and date molasses into the remaining lime juice and drizzle this over the salad. I served this with barbecued sausages.